All this great weapons training is on 2 full dvd's taught to you in an easy to follow step-by-step instruction manner. What are you waiting for? Get this course and become recognized for your study efforts! 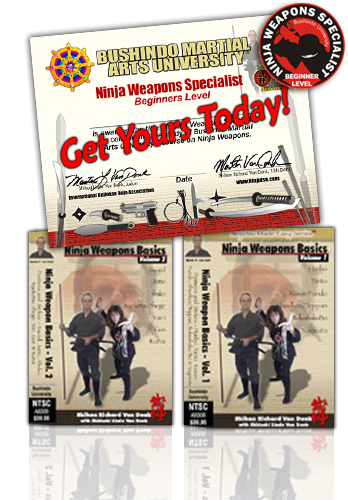 Bushindo Martial Arts University fully recognized Ninja Weapons Specialist Certification in a 8 .5" x 11" sized wall frame able certificate that comes direct with your course. These weapons are fun to train with! The Ninja used many weapons, both traditional and exotic so we share with you some of both. We start with the most commonly known Ninja weapons and share with you what they are, how they are used, postures to hold them in, and how to strike with them. This Ninja Weapons Course is made for you to practice along with and learn the correct weapon postures by name and then how to strike with them. Here is your opportunity to learn the aspects, postures and striking methods of 14 popular Ninja weapons that are used in Bujinkan Ninjutsu training. Until now there was nowhere you could get all this information in one place, especially in a course that you can get certified in. The entire course is taught by Shihans’ Richard and Linda Van Donk. © 2008-16+ Copyright by Bushindo Inc. / Richard and Linda Van Donk. All Rights Reserved for entire site and its contents. No images or text maybe reproduced without written permission.